Currently, only 0.3% of Australia's health workforce identifies as Indigenous, as this under represetation has a number of major implications for Aboriginal and Torres Strait Islanders accessing healthcare services. House Call Doctor, an after hours GP service is hoping to help address this imbalance, and shed some light on this important community health topic. To achieve greater awareness, they are offering a $10,000 Futures in Health Scholarship to Indigenous students completing a tertiary course in health or medicine. The Futures in Health Scholarship also has the support of one of Australia’s first Indigenous doctors, Dr Mark Wenitong. Applications close on the 15th of December 2017. I had the humbling opportunity to be part of the Torres Strait Islander delegation who shared the voice of Torres Strait Islander people at the recently held 2017 National Constitutional Convention (24-27 May 2017) otherwise known as the Uluru Convention. But, my journey to Uluru started as a young boy living on Thursday Island, Torres Strait, Queensland with my family in the suburb of Rosehill. We were living with my grandfather Cook Sailor a WWII veteran with the Torres Strait Light Infantry Battalion, church leader, provider and hunter. Who during our time wading through the low tide shallows between Thursday Island and Hammond Island foraging to provide for our household, shared stories of the past, the importance and responsiblity of being a Torres Strait Islander, and member of our family. Life long lessons which sometimes I forgot and made mistakes, but held within my spirit and identity. So as a I travelled with brothers and sisters on the Virgin Charter to Uluru with the Aboriginal flag draped in the walkway. I reflected on the Torres Strait regional dialogue, my fellow Aboriginal and Torres Strait Islander delegates, my family, but it was the memory of the time with my grandfather which I kept repeating in my mind, even when the view of Uluru loomed on the horizon as we landed at the local airport. 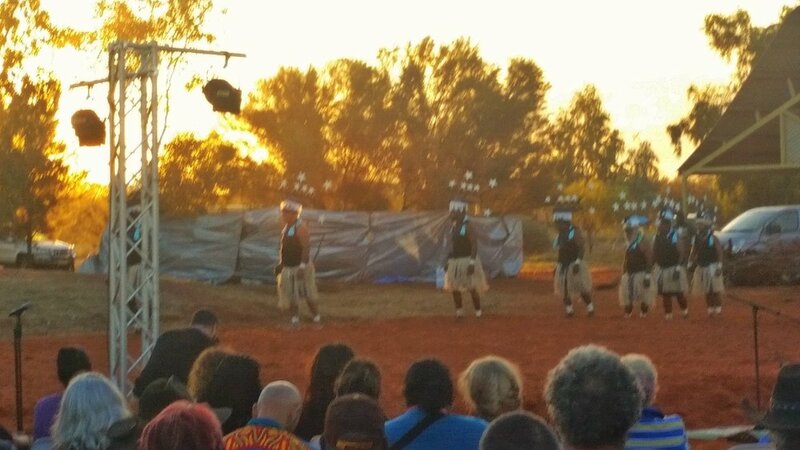 The opening ceremony was powerful and an opportunity for a visible sign of unity between Aboriginal and Torres Strait Islanders through dance and ceremony. It was in short awe inspiring and bittersweet at the same time as the realisation of the Northern Territory Intervention and other challenges Indigenous and non-Indigenous Australians are experiencing in our communities. Connecting with my fellow Torres Strait Islander delegates following the ceremony, we all realised that we were one voice of the Torres Strait regional dialogue and that we had a responsibility to demonstrate "debe pasin" (respect), share through action our unity with Aboriginal brothers and sisters but also all our Australian countrymen and women. The Uluru Convention discussions and insights I heard and was part of were on the whole shared from not just intellect but from spirit of voices of the past, present and future. But, it was the voice of Aunty Allison a local elder which resonated with me as we were on her peoples' country and had to pay respects to the land we were meeting on. Aunty Allison's wisdom shared in her language and English was a firm reminder of why we were meeting but also that we need to respect, listen, be open and create action from the event. Each day, I would enter the main meeting room and pay homage to the two immense flags which graced the walls of the room and my fellow Aboriginal and Torres Strait Islander delegates. I shared in the conversations and respected each speakers views even the brothers and sisters who made the decision to walk out of the Convention and air their frustrations. Who through their passion forgot the wisdom and words of Aunty Allison whose peoples' had invited us on their country. After three days of discussion and insights the Convention drafters composed "The Uluru Statement"
Our final action involved each of the Regional Dialogue delegations nominating three delegates (male, female and youth) from their regions to be part of the Working Group to continue the journey and lead the campaigns. Congratulations to all working groups members including for the Torres Strait Islanders, Ken Bedford, Rowena Bullio and Carla McGrath. But, the Uluru Statement and the Working Group are a presence but it will take ALL Australians in UNITY to create the sustainable change required. On the last day in Uluru, I took time out to reflect and pay respects to the country I had the humble opportunity to work on and also absorb the magnitude of what I had been part of over the three days, and the people I had the pleasure of connecting with and learn from. But, the whole journey for me was the cyclic memory and messages of my grandfather and other Torres Strait Islander relatives, friends and stories which I visualised on my Uluru journey. Because no matter where I walk within our global village as a business owner, community member, family member or as me I will always strive to empower and encourage sustainable, collaborative relationships to "maximise opportunities to make a difference" within our global village. Humbled to share this moment with my families. Murray Saylor - Founder & Managing Director of Tagai Management Consultants. Helllo family, friends and colleagues wherever you are in our global village. When you are marketing your business, community program or initiative the best place to start and maintain is in your local community or region. When we share that we want to give back to community keep in mind that it is not just through supporting the local community (e.g. financial, employment, sponsorship, etc) but also through you as a local community resident, leader, family member and entrepreneur. Even though you may not like it, you are a local having a go in the wider global village and a ROLE MODEL. Some people may not agree but, they are not the one's working towards their dreams. Let's celebrate our local community people, businesses, and community organisations making a difference, you are changing the status quo. Tagai Management Consultants is focused on "maximising opportunities to make a difference" in our global villlage. Tagai Management Consultants (TMC) is a Indigenous procurement and supply chain company focused on "maximising opportunities to make a difference". TMC encourages information sharing and collaboration within the marketplace. Recently, Laing O'Rourke adopted a company-wide Indigenous Procurement Policy. Effective from the 1st April 2017, all new projects will have a minimum target spend with Indigenous businesses. Laing O'Rourke want to achieve a better understanding of the Indigenous Supply Chain within different regions and sectors. Laing O'Rourke are asking Indigenous companies to register their interest for the work packages on the Industry Capability Network (ICN) website. This will give Laing O'Rourke an opportunity to understand the company's capabilities and to include them in future tenders. Refer to the following Industry Capability Network (ICN) link for further informatiion and registration details. TMC sourced information from the web address above. TMC will provide an overview of how we are maximising opportunities to make a difference on a quarterly basis. Innovators in the engineering, construction and resources sectors across the state can meet their match in a potential end user, investor or advisor in a new Queensland Government program opening on October 17. The Department of State Development’s pilot Engineering, Construction and Resources Innovation Hub (ECRI Hub) program aims to identify commercial opportunities in these sectors by translating ideas into products and services and exploiting their full potential. The program recognises the difficulty that small to medium enterprises can face in lifting bright ideas off the drawing board and into the board room. Under the first stage of the pilot program, up to eight participants will be selected to work with leading engineering and professional services company GHD to increase their market intelligence and understanding of the commercial value of their product. Up to three participants will be advanced to a second, more intensive stage of the program focused on developing industry partnerships and longer term outcomes. The Queensland Government will cover two-thirds of the $9000 Stage One and two-thirds of the $18,000 Stage Two costs, and participants will be expected to make a financial commitment. GHD will work with participants to develop an overview of their innovations’ opportunities by identifying possible industries, geographies, markets and clients and document the recommended next steps to commercialisation. By mid-next year participants are expected to have a product or service ready for market and a strategy to maximise growth. Expressions of Interest for the program close on 14 November. For more information and to apply visit dsd.qld.gov.au/ecrihub. A ground breaking strategic alliance has been established between Indigenous Australian procurement company, Tagai Management Consultants (TMC) and the Chartered Institute of Procurement and Supply Australasia (CIPSA), a global procurement and supply education and professional development service provider. Australia & New Zealand upon agreement by CIPSA existing suppliers. TMC can promote and deliver CIPS skills training, qualifications programs and capability development for those working or wishing to work in the Australasian region. This innovative collaboration is significant as it is the first time CIPSA has established a partnership with an Indigenous Australasian company. While writing this blog, I reflected back to the moment I was standing at the front of the CIPSA office in Melbourne after signing the strategic alliance document. The day was wet which if you have been to Melbourne is not out of the ordinary. I stood waiting for my taxi with a huge smile and thought about the road I had taken to get to that point, and what lay ahead. I developed my vision to establish an alliance with CIPSA empowering Indigenous Australasians with procurement and supply education and professional development in 2008, while working for Rio Tinto Procurement in Weipa. The road travelled has twisted and turned but the vision never went away. At that moment the taxi arrived, as I jumped into the taxi, uncle Kev Carmody’s (Aboriginal Singer-Songwriter) song “From little things big things grow” played in my mind. I would like to take the opportunity to thank Mark Lamb (General Manager, CIPS Asia Pacific) and Debbie Greenberger (Membership & Professional Development Manager, CIPS Australasia) for collaborating with TMC in the establishment of the strategic alliance. Also, I would like to acknowledge the support of my Aboriginal and Torres Strait Islander elders, my family and friends including “brothers” Alan Robertson (MCIPS) and Ramon Gomez. Murray Saylor is the Managing Director of Tagai Management Consultants. TMC’s motto is focused on “maximising opportunities to make a difference.” Click here to learn more. Recently, I was invited by the Ngā Kaitatau Māori o Aotearoa (National Maori Accountants Network) to be a speaker sharing “Thought Leadership from an ethnic perspective” at the National Maori Accountants Network Hui-A-Tau 2016 Conference (8-9 July 2016) held near the Waitangi Treaty Grounds, New Zealand. The Conference theme was “Future Maori Leadership”. Firstly, I would like to pay respects to the ancestors, elders and whanau where the Conference was held. I would like to thank the Ngā Kaitatau Māori o Aotearoa (National Maori Accountants Network) and the Whanau for the invitation and hospitality extended to me during my stay. Also, I would like to thank the other panel members, Simon Jones (Moana Seafoods) for his insights about Moana Seafoods, and Selwyn Hayes (EY Tahi) for his engaging facilitation of the panel. As a proud Torres Strait Islander to be invited to connect and share with our Maori brothers and sisters was immensely humbling, and spiritually empowering for me. My presentation "First Nation Wisdom within a Procurement Context" was inspired by my elders, culture and entrepreneurial spirit. The underlying message I presented was Indigenous knowledge systems and values was the innovation drivers in business, career, leadership and procurement. I stressed that in a village context each person played a role in its existence through concepts like “good pasin” (paying respect), teamwork, strong warrior leadership, and living hand in hand with the land, water (for me solwata) and sky, we were able to sustain our Indigenous economic and social livelihood. I shared Tagai Management Consultants as a case study to demonstrate how we have moulded our traditional cultural values with traditional supply chain and procurement thinking, and the outcomes we have been able to achieve. In the context of living in two worlds or more, First Nation business owners, entrepreneurs and professionals have a great responsibility to our families and communities in the continuing existence, and evolution of our cultures. Even more paramount is our symbiotic cultural existence allows all of us to be valued assets and leaders as we naturally view the world from a multifaceted perspective and ebb and flow with the environment around us. The key for employers, employees and entrepreneurs alike is to find the key to unlock the door that enlightens us to draw upon our cultural knowledge systems and apply it in a contemporary business context. I shared the journey is a personal one as culture and identity has differing connotations for each of us in our global village. Remain physically connected with what you consider your country or homelands. In closing, I shared that TMC business motto summarises what we endeavour to achieve and that we challenge the Conference whanau to strive for, and that is to "Maximise Opportunities to Make a Difference". What is the Difference between Supply Chain and Procurement? The terms Supply Chain and Procurement are the buzz words and strategies shared around the Private and Public sector but what do they mean? Understanding the terms, helps you better understand and leverage the different aspects of these important parts of your business. What is Supply Chain? A supply chain is a system of organizations, people, activities, information, and resources involved in moving a product or service from supplier to customer. Supply chain activities involve the transformation of natural resources, raw materials, and components into a finished product that is delivered to the end customer. Basically, everybody involved in getting your product in the hands of a customer. What is Procurement? It is the act of acquiring, buying goods, services or works from an external source. It is favourable that the goods, services or works are appropriate and that they are procured at the best possible cost to meet the needs of the acquirer in terms of quality and quantity, time, and location. Some of the tasks involved in procurement include developing standards of quality, financing purchases, negotiating price, buying goods, inventory control and disposal of waste products like packaging. To explain the difference between Supply Chain and Procurement let us use the "chair" analogy. Supply chain is seen as the entire chair and Procurement and its subsections like Sourcing are seen as the legs in support. Tagai Management Consultants has the expertise and resources to work with your team to either develop, sustain, grow and/or improve your Supply Chain and/or Procurement Framework via Capability or Learning to your Department, business, organisation and community. When you are ready contact Tagai Management Consultants and let us discuss appropriate strategies for you. I will introduce in a later blog the subsections of Procurement: Sourcing and Global Sourcing. Our Managing Director, Murray Saylor was invited by Deakin University to be part of a panel to share insights on the issue of "Governance and Indigenous Organisations" at the inaugural Indigenous Accounting and Business Conference in Melbourne (September 2015). After paying my respects as a Torres Strait Islander on the land we were meeting I shared some of my observations on the panel topic. How governance is viewed and worked through is different between Aboriginal and Torres Strait Islander communities due to in my opinion their differing governing influences and internal governance perceptions which will differ from community to community. We do not celebrate enough of our governance success stories internally amongst our communities and in the wider Aboriginal and Torres Strait Islander communities. This also extends to exploring opportunities to learn from success stories in a collegiate manner between communities. All of the abovementioned challenges also provide an opportunity for change and innovation. For our communities to remain viable, vibrant and our Aboriginal and Torres Strait Islander cultures to thrive and continue, educated Indigenous professionals are responsible to give back to their communities in way of sharing their intellectual capital. Also, Aboriginal and Torres Strait Islander communities and company boards have to be open to working with Indigenous Consultants in community service delivery. But, most importantly our Boards need to move from a genealogical directorship model to a skills based model underlined with strong value principle governance foundations. If you are a community and/or Company Board that is looking at establishing or improving your governance systems and processes do not hesitate to contact Tagai Management Consultants via email info@tagaimanagementconsultant.com.au for a initial free consultation about your challenges and governance requirements. Tagai Management Consultants has become a fully certified Supply Nation Supplier. Becoming a fully certified supplier provides a unique level of access to corporate and government buyers. The fusion of Indigenous flavours in modern cuisine is common place in Australia. But, the appreciation of what being achieved by this great social enterprise has to be applauded. We enjoyed the following dishes which had our taste buds wanting more....maybe another time when our bellies had recovered. - Desert lime & Cocoanut Panna Cotta. If you are in Melbourne looking for cuisine with a Indigenous flavour head over to Charcoal Lane a great restaurant with a strong focus on giving our young people a fresh start. Today, our Managing Director, Murray Saylor had the pleasure of being invited to speak about "Careers and Education" at the Kambu Health Ipswich Education, Youth & Sport Program (10-17 years old students). The speech was focused on sharing that Education is not just about learning out of a textbook, we are all Superheroes and importance of maximising opportunities to make difference. We are all Superheroes - Going through the education system is in a way exploring what superpowers we have and what career pathway we consider in the future. It was stressed that it is important recognise our own superheroes and to remember the superheroes from the past for example Mr David Unaipon. Maximise Opportunities to Make a Difference - The kids were encouraged to explore learning opportunities like the program and seek advice from their mentors, parents and the networks they developed during the week long program. Whether its our kids or us as adults and business owners we get caught up in life's trials and tribulations it is important to remember we are all Superheroes, but even superheroes need support to succeed. Tagai Management Consultants would like to thank Kambu Medical and USQ for the opportunity to assist our talented Aboriginal and Torres Strait Islander superheroes at the inaugural Kambu Health Ipswich Education, Youth & Sport Program.